It’s release day here at Ziflow! As we’ve covered on the blog before, the first few releases since our October launch were focused on the core online proofing use cases, a well as performance and scalability. March was a very busy month for the Ziflow product development team. Today’s release includes several new capabilities, each aimed at helping marketing teams deliver their creative projects faster and more efficiently every day. Large, distributed teams, should especially take note of today’s release as we’re making it even easier for agencies and brands to adopt online proofing as a replacement to emails, printouts and sticky-notes as a means of providing feedback on creative content. Let’s take a look at a few of the highlights in this month’s release. 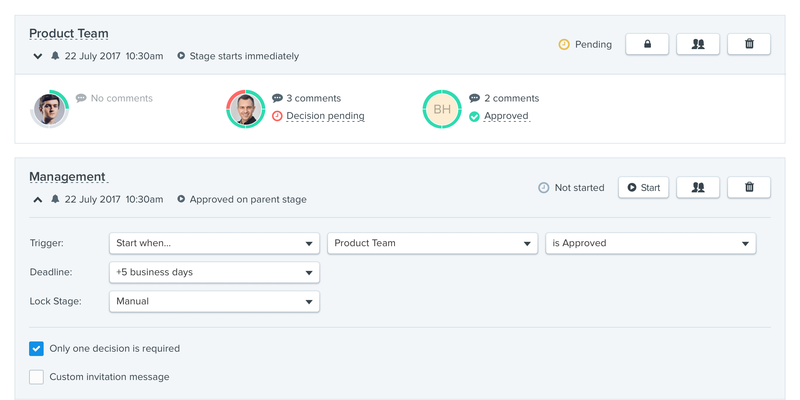 One of the most frequently requested features since launch, Automated Workflow, delivers a great new addition for teams with multi-stage review processes. If your review and approval process spans multiple teams inside or outside of your organization, you can now create a workflow to automate the proof routing. Keep an eye out for next month’s release that will expand on the available stage triggers and the addition of Workflow Templates. As part of Ziflow’s goal of being the go-to choice for all your review and approval needs we now offer Rich Media (HTML5) support. If part of your marketing efforts include HTML5 banner ads, websites and other rich media content, you can now review those using Ziflow. 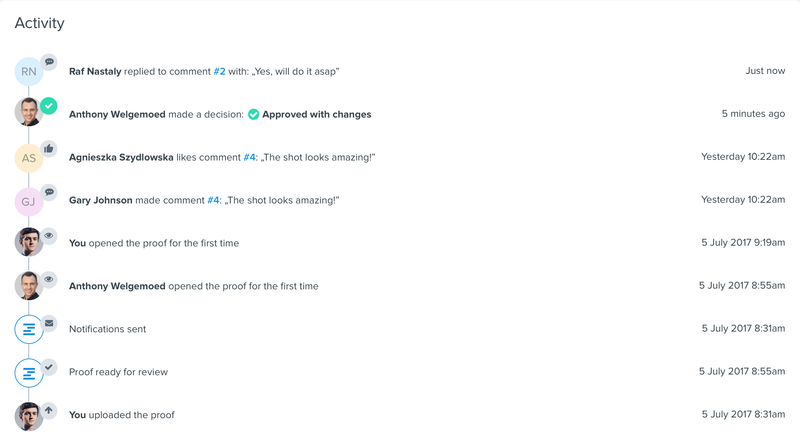 Use the same markup and commenting tools your reviewers are already familiar with, while being able to play the design to completion and pausing the build at any point to provide feedback. The proof details page now includes a real-time stream of activity giving you full insight as to when a proof was created, decisions were made and reviews completed. Look out for future releases that will expand on the types of activity to be included in this section. We’ve added a new type of role which can be selected when managing users in your account. Managers can manage all proofs, folders, flows and connected applications on behalf of Admins. They are precluded from account, billing and user management by design. Partners and developers now have the ability to suppress all proof email notifications when using our API. The new parameter “suppress_all_emails” is available on the proof object and if true suppresses all the proof related emails (new proof notifications, comments, decisions, etc.). This is incredibly useful for teams that have embedded Ziflow into their own or 3rd party applications, where notifications are being handled by another application. (If you haven’t read about the Ziflow API, you can learn more here). Lastly, we’ve also adjusted our proof viewer default to display proofs at 100% resolution upon loading. To keep up with all our product announcements, you can subscribe to our blog below. Current customers and those in our 14 day trial will see these new features immediately.